Thank you to everyone who has been reaching out to me with wishes for my father’s speedy recovery as well as why I haven’t been posting(related to my father’s health issue) but also, I am about to go dark for just about a week as I head off to the great northern woods for a 6 day canoeing and deep woods backpacking trip. So if you are reaching out to me during the next week please be aware I will not be replying for awhile! Testing the skills and equipment!! As a Ninjutsu practitioner my training is of course physically and mentally demanding, and so healing and staying well fueled for my nest session can always be a challenge! Over the years I developed the following 7 Tips that I use and teach to my students on a regular basis. I hope you adapt them and or suggest additional tips for our readers to learn from. Make nutrition an integral part of your training program. Nutrition should never be an after thought in your training program it should be thought out in advance to meet your nutritional needs. Without proper nutrition, how can you begin to achieve the optimum performance level you are seeking? Start a nutrition log book. Track your consumption of various foods, amounts types etc, and how this relates to your workout energy and recuperation time. Review the various books and source material on the amount of calories and types of nutritional guidelines your sport will require, and set that down in your training plan. If you have to consult with a sports dietitian, and stay away from trendy diet fads and supplement advertisements! Now everyone has a busy schedule to maintain, but if you are serious about improving your sports performance you need to schedule time to shop for good nutritional foods. Search your local area for the best produce, meat and dairy sources. Even search for low cost wholesalers, this will definitely help your budgetary process. Good quality food can get expensive if you are not careful, so spend the time to bulk shop, freeze down individual portions and plan your weekly meals! A key nutrient in your program has to be fluids!! Concentrate on taking in adequate amounts of water, and other fluids to prevent dehydration. Monitor your urine output to ensure you are drinking enough fluids on a daily basis. You should be urinating frequently (every 2 to 4 hours); it should be light colored, not dark and odiferous. That is clearly a sign of dehydration!! Be flexible, and resilient to food changes. Every season has a host of great food choices, so avail yourself to locally grown fresh produce in the summer months! Over the remaining parts of the year switch of to other items grown in various parts of the world! Pay attention to those cravings you are having they may indicate a nutritional or caloric need in your diet! Supplements are just that SUPPLEMENTS! Your first requirement is adequate nutrition through good quality sources. If you require more than that, seek out high quality supplementation. Don’t fall into the trap that a supplement will give this huge leap in your nutrition, it won’t! It is up to you to maintain the dedication to ensure this critical aspect of your training is maintained! As a final tip, make sure you are getting adequate time off from your program to recuperate! Take a nap, sleep in late, eat plenty, drink enough, all of this will help you make great leaps in your training goals. The hardest part is the first step………Taking Action! I found this quote from Soke Hatsumi the other day in my notes from an early TaiKai question and answer session, and it rings so true these past few weeks. I have had the opportunity to treat superficial cuts, scratches, nosebleeds , all the way up to splinting a broken arm, turn around and have family emergencies, work emergencies and just everyday life thrown in the mix. But each day, I got up facing the day as a new challenge to test and exercise my Ninjutsu skills, everything from Taijutsu, first aid, kajutsu, all the way to fudoshin. As I look back over the last few weeks I realize how powerful the warrior traditions we hold dear and practice truly are, and it invigorates me to dive in and practice and glean more knowledge from this powerful art of Ninjutsu! Ps: Pass this post along on your FB pages! More realism in your Weapons training! 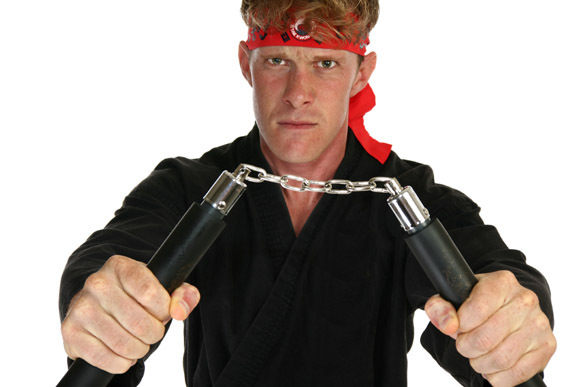 Many if not all ninjutsu practitioners practice with weapons. It is in our fundamental skills to learn the arts of Bojutsu, sojutsu, kenjutsu, kakushi bukijutsu and more, but one thing I have noticed is many many students, flail away in the air and think they have practiced, sometimes to perfection. My answer to this, is to sit back and laugh a bit, and ask this question, “have you ever hit or cut anything with that weapon?” Most give me a weird look, but those who know and understand ninjutsu , take away a great lesson here. Flailing away in the air, practicing a kata, or shadow sparring are all good tools for developing some types of skill, but for actual combat you need to practice realistically and feel what it is like to use a tool in hard striking and cutting. This must be done repetitively, and you will understand that when a resilient target is placed before you, Mr. Murphy rears his ugly head and your perfect air strike is deflected and has no power, or your cut folds the target in two, I have even had what I thought were decent quality weapons break apart under these types of training conditions. Let’s take an EDC tool such as your pocket/folder blade. Do you actively practice with it? Since most will answer no, then why they Hell not! You carry it everyday, you use it to open a box or a bag, or maybe cut a piece of rope, but when was the last time, you practiced deploying it using your dominant hand, your non dominant hand, sitting, kneeling, when mounted, upside down etc, etc. Now let’s add target cutting: cardboard cutouts with vital points outlined, straw mats, milk jugs, old clothing and jackets wrapped or filled with lifelike material, animal carcasses, left handed, right handed, from various positions, for time, in the dark, wet hands…. I think I may be making my point here – Make your weapons training as realistic and with what you may find around you or you carry as many times as possible! Don’t forget safety, have your first aid kit ready, cell phone on 911 speed dial etc. Always be prepared for something to go wrong. Alright, Ninja fans get to work and take your weapons skills into the modern day. A Case for not using your head! Recently a student I were training in close quarter stick fighting, and they kept hesitating, and so I asked them what was the matter, and there answer was “ I keep thinking about what I should do next after I counter.” I started to laugh as we have all been there at one point or another, analysis paralysis. Thinking too much on what is to happen or what you need to do next can get you killed very quickly. So, my advice to him was, relax – don’t think, just do. React and deal with the next situation as you just dealt with the first one, flowing without hesitation. I use this analogy when I am trail running, dodging branches, flowing up and down the steep deer trail, or logging path I am on. If I was to “think” my pace would be very very slow, but when I am in the flow, it just happens on autopilot. So today’s lesson is—-In your next workout(whatever it is) move without analysis, flow with whatever is happening, expand your senses and awareness to their fullest potential. Now watch out as you may actually start to like this!! This entry was posted in Uncategorized on June 1, 2014 by admin.